Hi everyone! 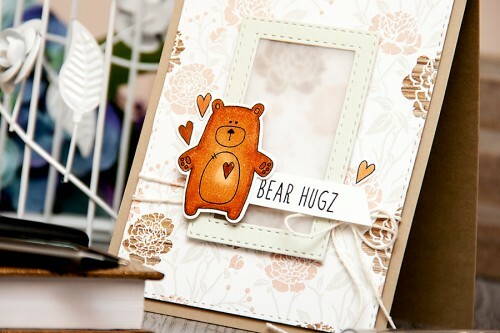 I have a Bear Hugs card to share with you today using the most adorable bear image ever! This one is from the Hop To It release from Simon Says Stamp which went live last month. I haven’t had much time to play with these stamps but I was sooooo happy to finally sit down and make this Bear card. Isn’t this bear the cutest? I used my Copic markers and did some very basic coloring. I cut out the image a matching die and also stamped, colored and cut out several heart from the same stamp set. As an additional element for my card I die cut a stitched frame using the Stitched Rectangles die set from Simon. Love the way it turned out! I could have turned this into a simple shaker card, but instead I added a layer of vellum to mute the patterned paper inside the frame. This is just the cutest – love the vellum in the frame. 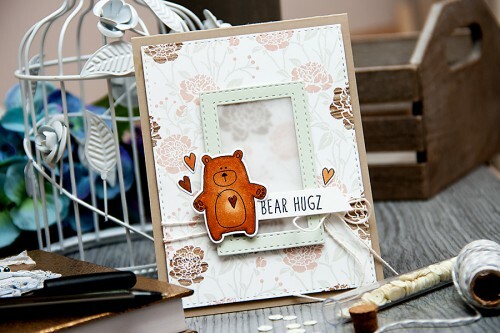 There’s not a lot of white space here, but this is a fabulous, simple design, with terrific paper and a really cute bear! Love the use of vellum!